You are currently browsing the BestOfBothWorldsAZ.com blog archives for the day Friday, September 10th, 2010. Bring water to boil, add tea bags and remove from burner. Allow tea bags to steep for 5 minutes. If tea bags are left in longer you will have bitter tea. Add sugar while tea is still hot, this will allow it to completely dissolve. You can add a tiny pinch of baking soda, this will reduce bitterness. Allow to cool before pouring into pitcher. A glass pitcher is best, for pure flavor. 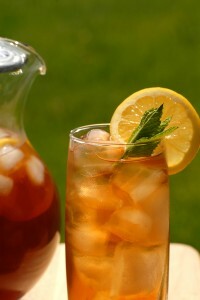 I recommend pouring over ice, when tea is served, so that ice will not melt and dilute tea. Sweeten to taste: Southern tea tends to be a little sweeter so you can add up to a full cup of sugar. Un-sweetend: If you are like me and prefer your tea unsweetened I recommend using spring water. The sugar in sweet tea covers the taste of minerals that are in tap water. Garnish: Lemon wedges are great, however so are orange slices, frozen berries and mint leaves. Sun tea: My favorite, this is the way my grandma makes it. I don’t have the time. Place pitcher of water with tea bags in sunny area. Allow tea bags to steep in pitcher of water for 3-5 hours. Sweeten while warm. Green and White Tea: Green and white tea can get bitter fast, so only steep 3 minutes. Do you have a favorite tea or tea recipe ?